Notes: The above-normal January temperatures have continued, allowing us to band three times within a week for the first time in winter, including two sessions on the weekend. The 51 new birds banded is an impressive number for this time of the year, bringing our winter total to 255 since the beginning of November. This equals the total for the winter of 2004-05, with 9 weeks left to go. 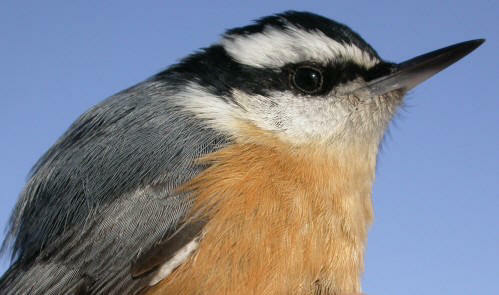 Two new species were added for the season as well: Red-breasted Nuthatch and Northern Shrike. It was very interesting to see how different the results were each day. Monday gave us the first indication that our luck with Common Redpolls was improving, as we banded more of them (6) than any other species. The list of birds banded was quite diverse that day, including House Finch and American Tree Sparrow, neither of which we had banded yet this year. Among the 12 recaptured Black-capped Chickadees were 6 from a sequence of 9 banded since early December - they seem to be sticking together! Saturday morning the weather was gorgeous - sunny, and around +5 Celsius! The only downside was the wind, which although not uncomfortable given the warmth, did buffet the nets quite a bit and allowed many birds to avoid getting caught. Nonetheless, the redpoll numbers continued to climb, with another 7 added. Among them was a "coppertop" - an individual with a coppery-orange crown instead of the usual red. American Goldfinches were the most abundant bird of the day though, with 9 banded. By Sunday morning the temperature was considerably lower, and a winter storm was on the way, but we still managed to squeeze in another short but productive session before the weather became too bad. Surprisingly, given Saturday's results, we didn't catch a single American Goldfinch. However, another 11 Common Redpolls were banded, bringing the week's total to 24. 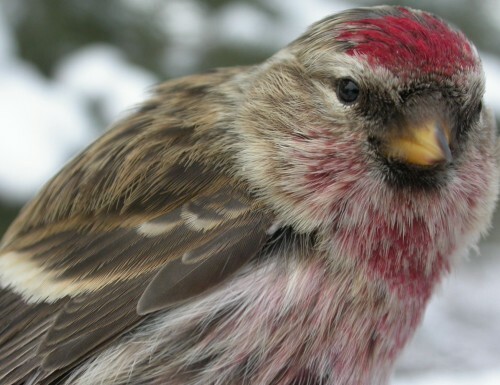 Interestingly, we have yet to recapture any redpolls, suggesting that the "flock of 30" we have been seeing regularly is actually much larger, and that we're only seeing a fraction of it at any given time. The only other species banded on Sunday was the first Northern Shrike of the winter season, an aggressive second-year bird.